Today I have the Summer edition of my series Color Palettes. Just some seasonal color inspiration in manicure form! This Summer, I've decided to keep it pretty straightforward, showcasing the color that most clearly says "Summer" to me: bright, greeny turquoise! To offset the turquoise, I've chosen white and a hint of rose gold! Ready to find out what this amazing color is? This is Emily de Molly- Queen of the Sea, and it's incredible! (I'll have a plain swatch coming of it soon as well.) This is actually the first shimmer finish I've tried from Emily de Molly, and I'm pretty blown away, have to say! The formula is smooth and incredible with high pigmentation, and the shimmer is super dense and very vivid! This polish is quite changeable too- it looks like a much bluer turquoise outside in natural light. The accent colors are KBShimmer- Eyes White Open (white) and Essie- Penny Talk (rose gold). I don't know why it took me this long to use Eyes White Open as a stamping polish, but look! It stamps really nicely! Better than any white I've tried, actually. The scale/ scallop design is from MoYou London- Sailor 05, as are the seahorses on the thumb. (So sorry I keep on using the same plate over and over- just adore it!) The mermaid on the middle nail is from MoYou London- Fairytale 02. What are your favorite colors to wear on your fingers in Summer? 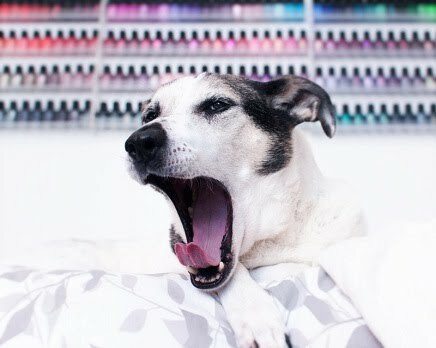 [Press Release] Zoya Nail Polish Exchange! Mail-time: ILNP Fall 2015 Collection! Empty Empty Empty: June & July!